Niagra Large Print, 1996-02. Hardcover. Good. 1994-09-02. New. Ships with Tracking Number! INTERNATIONAL WORLDWIDE Shipping available. Buy with confidence, excellent customer service! Random House Audio, 1994-08-09. Audio Cassette. Used:Good. 1994-05-05. Good. Ships with Tracking Number! INTERNATIONAL WORLDWIDE Shipping available. May not contain Access Codes or Supplements. May be ex-library. Shipping & Handling by region. Buy with confidence, excellent customer service! 1995-09-04. New. Ships with Tracking Number! INTERNATIONAL WORLDWIDE Shipping available. Buy with confidence, excellent customer service! Random House Audio, 1994-08-09. Audio Cassette. New. Brand-new, unused, unopened in perfect condition. New York: VIllard Books, 1994. Book. Fine. Hardcover. Signed by Author(s). First Edition/First Printing. A square solid tight very carefully read copy. This copy has just a hint of soil to the edges of the text block else fine. A great read if you are a fan. This copy has been signed and dated Jan 14 2003 by David. THIS COPY IS IN MY POSSESSION AND NORMALLY SHIPS NEXT DAY..
NY: Villard, 1994. First edition, first prnt. Inscribed by Halberstam on the title page. "for Steve Walts with best wishes David Halberstam September 30, 1994." Black and white photographs. Spine cloth minimally rubbed on edges; dustjacket with interior bottom edge offsetting (not visible on the outside). Near Fine condition in a Near Fine dustjacket with an archival cover.. Inscribed & Dated by Author. First Edition. Hardcovers. 8vo - over 7¾" - 9¾" tall. The images are of the book described and nots tock photos. Villard. Hardcover. 0679415602 1st edition 1st printing signed by Halberstam on title page - minor staining to page edge - otherwise dust jacket and cover fine binding strong contents clean (now in mylar cover) enjoy . Very Good. Villard. Hardcover. 0679415602 1st edition 1st printing - signed by Halberstam on title page - price clipped - some staining to page edge - minor wear to edge of dust jacket (now in mylar cover) otherwise cover fine binding strong contents clean - enjoy . Very Good. New York: Villard Books, 1994. 1/13/2009. Fine/Fine. First edition. Fine in fine dustwrapper. Villard. Hardcover. 0679415602 New Condition. . New. 1994-09-02. Good. Ships with Tracking Number! INTERNATIONAL WORLDWIDE Shipping available. May not contain Access Codes or Supplements. May be ex-library. Shipping & Handling by region. Buy with confidence, excellent customer service! Villard. Hardcover. 0679415602 New Condition *** Right Off the Shelf | Ships within 2 Business Days ~~~ Customer Service Is Our Top Priority! - Thank you for LOOKING :-) . New. New York: Villard Books, 1994. First edition. Stated. Hardcover. Very good/very good. xiv, 380,  p. Illustrations. Bibliography. Following his #1 baseball bestseller Summer of '49, David Halberstam gives us the Yankees-Cardinals World Series that concluded the '64 season--a transformational American moment, both inside and outside the ballpark. A book of deep insight and importance, October 1964 is also, like Halberstam's previous baseball work, a great read. Villard. Hardcover. 0679415602 Like New Condition. . Fine. New York: Villard Books, 1994. Out of print. In a Mylar cover. A perfect copy.. First Edition. Cloth. Fine/Fine. 8vo. New York, New York: Villard Books / Random House, Inc., 1994. Light rubs at lower edges and corners of boards and tail of spine. DJ with light rubs at upper corners. Stated First Edition with number line's lowest number of '2' as per Villard / Random House's method for First Printing at time of publication. Illus. with B&W photos. Incl. Biblio. 380 pp.. First Edition, 1st Printing. Hard Cover. Near Fine/Near Fine. Ballantine Books. PAPERBACK. 0449983676 Remainder mark . Fine. Ballantine Books. PAPERBACK. 0449983676 Minor shelf wear . Very Good. Villard, 1994-08-02. 1. Hardcover. Used:Good. New York: Villard Books. NF/NF. 1994. 1st Edition. Hardcover; 1st Printing. 1st edition/1st printing. Near fine book (clean, straight & tight), spine ends are lightly bumped from shelving and there is a small ding on the lower edge. The near fine dust jacket is clean, bright & clean with a touch of edgewear at one flap fold and spine ends from shelving. An exciting, new book about baseball, about the last season of the Yankee dynasty. ; B&W Photographs; 9 1/2" x 6 1/2"; 380 pages . New York: Villard, 1994. First edition. Hardcover. Very fine/Very fine. A journalist fan's reenactment of the 1964 World Series with the New York Yankees (Mickey Mantle and Roger Maris) against the St. Louis Cardinals (Lou Brock and Bob Gibson). Book is in pristine condition as is jacket. No markings, soiling, bent pages, bumped corners, etc. Very fine. Binding is tight and firm. Jacket is pristine in as new condition. Photographs. First edition so stated. In protective sleeve. Not price clipped. In excellent gift giving and collectible condition. New York: Villard, 1994. 1st Edition. Hardcover. Near fine/neat. 1st Edition. Hardcover. Crease front flap of DJ. N.Y.: Villard Books, 1994. First edition. Hardcover is in near fine condition as is the dust jacket. Real Nice Copy.. First Edition. Hard Cover. Fine/Fine. Villard Books, 1994. Book. Fine. Hardcover. First Edition. 8vo - over 7¾" - 9¾" tall. Near-new condition. Stated First Edition. Number line: 98765432. Illustrated with photos -- NO remainder marks or price clippings. Price inside dustcover: $24.00. Tight spine, clean pages. NO writing, marks or tears inside book. 383 pages. In 1989 David Halberstam published Summer of '49, which became a #1 New York Times bestseller. It was a compelling portrait of baseball in an America as yet unchanged by affluence, technology, and social progress. The players, almost all white, had been raised in harsh circumstances, the games were played in the afternoon on grass and were broadcast on radio, the teams traveled by train, and the owners had dictatorial power over the players. Here also was the story of the Yankees winning the first of their pennants under Casey Stengel before going on to become baseball's greatest dynasty. 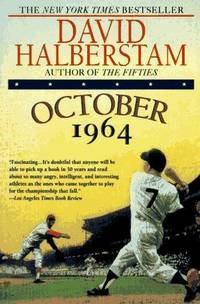 October 1964 is Halberstam's exciting new book about baseball -- this time about the last season of that Yankee dynasty. Like the previous book, it is both sports and history, and it is a fascinating account of an electrifying baseball championship against the background of profound social change. The Yankees, like most American League teams, reflected the status quo and, in contrast to the National League teams, had been slow to sign the new great black players (indeed, for a time, their best scouts were ordered not to sign them). Though the Yankees boasted such great names as Mantle, Maris, and Ford, theirs was an aging team: Mantle, hobbled by injuries, was facing his last hurrah in post-season play. By contrast, the St. Louis Cardinals were a young tough team on the ascent, featuring talented black players -- Bob Gibson, Curt Flood, Lou Brock, and Bill White -- who were changing the very nature of the game with their unprecedented speed and power. Halberstam has once again given us an absorbing tale of an exciting season and a great Word Series that reflected a changing era in both baseball and the rest of society as well: The fabric that insulated baseball from the turmoil in the rest of the country was beginning to tear. We get intimate vignettes not only of the players but also of the scouts who signed them including the black scouts who had been denied the chance. 8vo - over 7¾" - 9¾" tall. Villard Books, 1994. (1st) DJ and book, both Very Fine.. First Edition. Hard Cover. Very Fine/Very Fine. Ballantine Books. PAPERBACK. 0449983676 Special order direct from the distributor . New. New York: Villard Books, 1994. Second Impression. No Inscriptions, slight bump to corners. Dustwrapper not price-clipped, crease to edge. 381pp. . Hard Cover. Very Good/Very Good. Random House Audio, 1994-08-09. Audio Cassette. Good. New York: Villard Books, 1994. OCTOBER 1964- David Halberstam- Villard Books-NY-1994-1st Edition-1st Printing-Stated-ISBN 0-679-41560-2. -Hardcover:-Large 8vo-FINE/FINE in unclipped Dust Jacket.- as new- GIFT QUALITY! !- 380pp are clean and crisp- photo endpapers of St.Louis Cardinals & New York Yankees-SEE PHOTOS- "From the author of the bestseller "Summer of "49", this book describes an electrifying baseball championship against a background of profound social change. "- Non-fiction-history-sports-baseball-World Series-social changes (1771) . 1st Edition-1st Printing. 1/4 Cloth & Boards. Fine/Fine. Illus. by Illustrated-B&W-photos. 8vo - over 7¾" - 9¾" tall. US: Villard. Hardcover. 0679415602 * Very good in Very good price-clipped dust jacket. First Edition. books carefully packed and shipped promptly . Very Good. 1994. New York, NY, U.S.A.: Random House Adult Trade Publishing Group, 1994. 1st ed. Fine in Fine dj. HB. First Edition.. Hard Cover. Fine/Fine. NY: Villard, 1994. First printing. Near fine in a near fine dustjacket with minute edgewear and a small crease to front inside flap. Not priceclipped and no markings.. First Edition. Hard Cover. Near fine. NY: Villard, 1994. First edition. Fine in a fine dj. The Yanks vs. the Cards. Another great baseball book from Halberstam.. First Edition. Hard Cover. Fine/Fine. New York, NY: Villard, 1994. Book. Very Good+. Soft cover. Reprint. Minor wear; otherwise a solid, clean copy with no marking or underlining; a good reading copy; illustrated with black and white photographs..
New York: Villard Books, 1994. First edition. Hardcover. First printing. A look at the New York Yankees of 1964. A fine copy in a fine dust jacket. Villard. Hardcover. 0679415602 Ships from Tennessee, usually the same or next day. . New. 1994. Villard, 1994-01-01. First Edition. Hardcover. Fine/Near Fine. Hardcover with dust jacket. Stated First Edition. 1st printing (complete number line). Clean and tight. No markings. Dust jacket is price-clipped, otherwise fine. Ships in a box. Fast shipping from NYC! NY: Villard Books, 1994. Remainder. Very Good+. Quarter-cloth. First Edition. 8vo - over 7¾" - 9¾" tall. 380pp. The story of the last season of the great Yankee baseball dynasty that included Mickey Mantle and Roger Maris. Very Good+. Ballantine Books. PAPERBACK. 0449983676 Item in very good condition! Textbooks may not include supplemental items i.e. CDs, access codes etc... . Very Good. Ballantine Books, 1995-04-11. Paperback. Used:Good. New York, New York: Villard Books, 1994. 380 pages, prologue, epilogue, list of interviewees, bibliography, and acknowledgements, 11 pages of black & white photos; clean, unmarked text; tight binding with slight lean; illustrated end papers, small chip in both back end papers; red boards with black cloth backstrap, gilt lettering, author's initials (DH) embossed on front cover; upper corners are bumped; DJ is in near fine condition with very slight edge wear.. First Edition. Hard Cover. Very Good/Near Fine. New York: VIllard Books, 1994. Book. Very Good +. Hardcover. First Edition/First Printing. A square solid tight very carefully read copy. This copy has a group of about 10 pages that have light creases from having the book closed on them as the result of bad handling. A great read if you are a fan. THIS COPY IS IN MY POSSESSION AND NORMALLY SHIPS NEXT DAY..
Villard. Hardcover. B002I8DOWS Very Good Condition. Five star seller - Ships Quickly - Buy with confidence! . Very Good. Ballantine Books. PAPERBACK. 0449983676 signs of little wear on the cover. . Very Good. New York: Villard, 1994. Book. Fine. hard. 2nd ptg. Bibliography. World Series featuring New York Yankees vs St. LouisCardinals b/w photo endpapers. fine, fine price-clipped dj, charcoal cloth sp w/ red bds 380 pgs.